Thanks to our wide variety of advanced holistic treatment methods, health, quality of life, and pain free living have never been so easy to achieve. This natural approach to healing utilizes the entire human body, not just the spine, to enable the body to reach its full potential and well-being. This approach is called Applied Kinesiology. 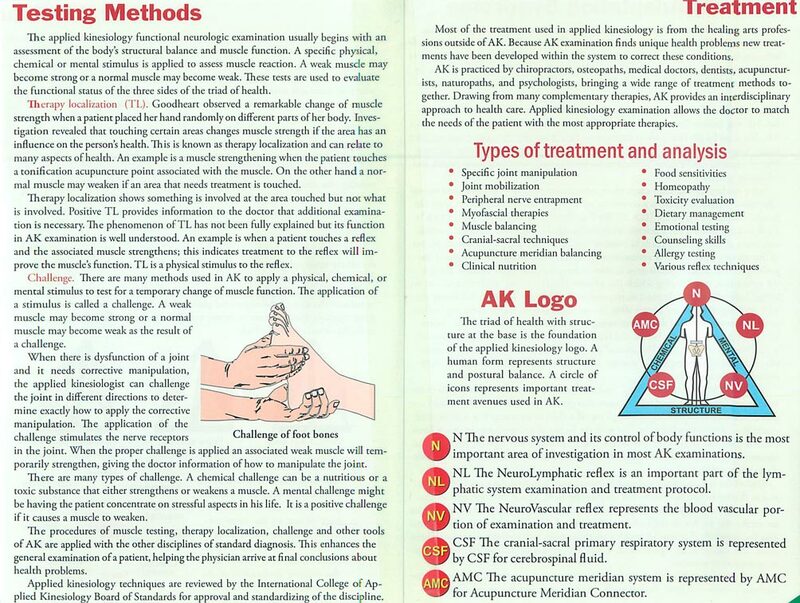 Applied Kinesiology is the most advanced diagnostic and treatment strategy known to mankind. 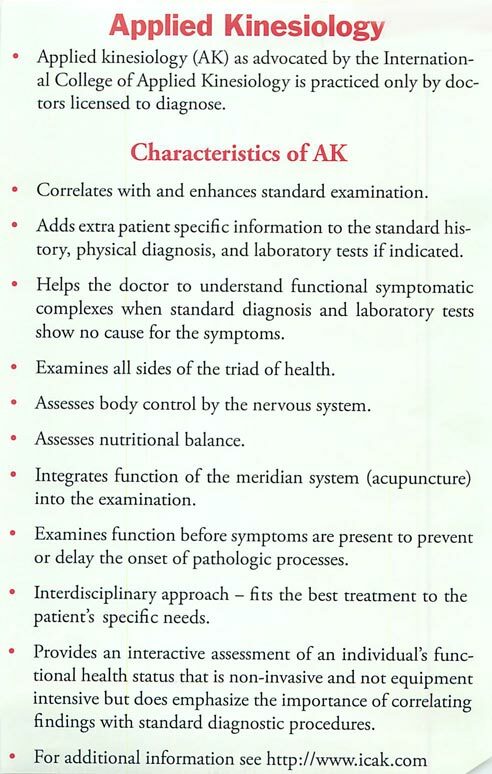 Applied Kinesiology evaluates the body's Structure, Chemical Function/Nutrition, and Mental/Emotional state in order to treat the entire person as a whole. 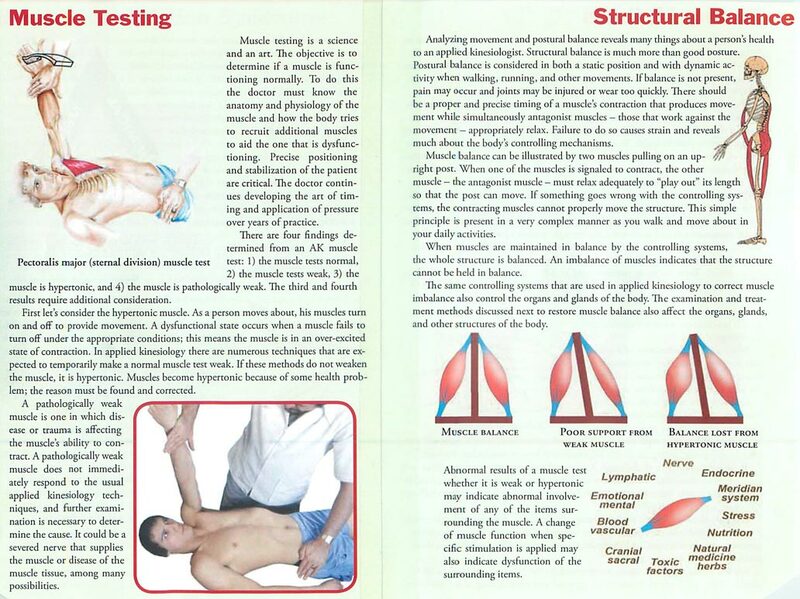 The body is functionally and neurologically tested and evaluated in order to diagose what the individual patient needs, and is then treated accordingly. Unfortunately, most people are not aware or choose to ignore the obvious clues that the entire body works together and needs to be treated as such. For example, have you ever felt emotionally drained and or stressed out, then for some "unknown" reason get a stomach, back, neck, shoulder, or headache? This happens all the time because the entire body is connected and your brain can affect the body's structure or structure can effect the body's chemical balance etc! This is were Applied Kinesiology offers unmatched, unbelievable benefits (use the body to decide what the body wants/needs) to treat the cause of the problem, not just the symptoms.